Skater dresses have managed to maintain their popularity for quite some time now and newer designs are surfacing all the time. 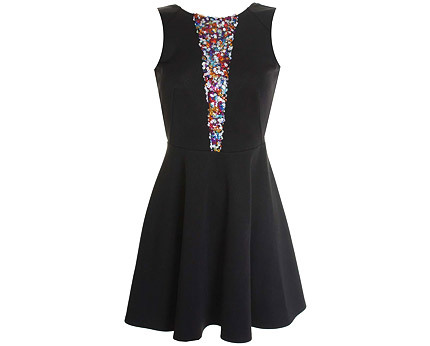 Love black Marcella skater dress is the perfect party dress this season, its strikingly beautiful featuring a lovely glitz of sequins graduating down the plunging neck line. 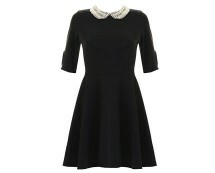 For a change to the regular LBD this skater version with a pop of sparkle is a great choice! Skater dresses flatter all figures as they create the illusion of slimmer waists and the wide hem lines balance out body proportions perfectly. The cut is perfect for all shapes, fuller figures can create an illusion of a smaller waist and petites can fake some fabulous curves. 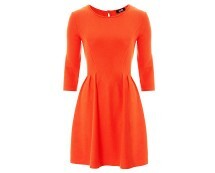 To style this dress pop on some towering heals or wedges, shoe boots also look great! And a simple cropped jacket will complete the look. For a rock chic vibe try faux leathers or studded jackets instead!